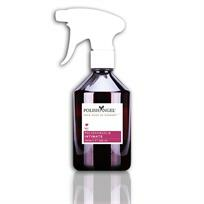 INTIMATE is specially formulated for all delicate surfaces found in automotive interiors. Its active gel cleanser is easy to use and removes stains and grime from synthetic fabric upholstery, carpets, floor mats, head liners, vinyl, leather and plastics. A carefully selected and balanced blend of active ingredients and pleasant de-odourising agents allows fast and deep cleaning.